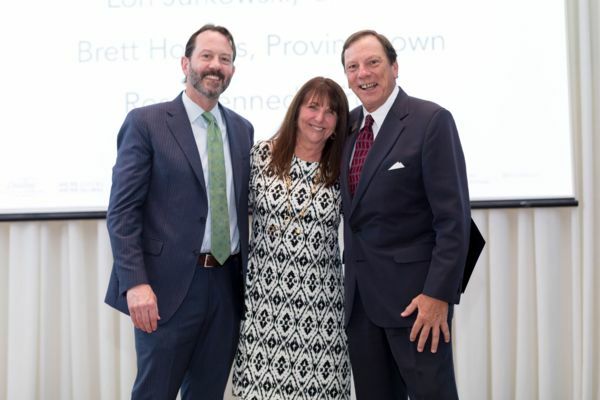 Osterville, MA – March 26, 2019 – To cap off its record-breaking $1 billion-dollar year of sales, Kinlin Grover Real Estate recently recognized its agents’ 2018 individual sales achievements at its annual awards gala held at the Chatham Bars Inn. Sandra Tanco of Kinlin Grover's Harwich Port office took the top honor in the Chairman's Guild category, an award presented to agents with the highest volume of residential sales in 2018. Lori Jurkowski of the Chatham office, Brett Holmes of the Provincetown office and Rose Kennedy of the Truro office were also recognized in the Chairman’s Guild while Jane Booth, Maggie Kulbokas and Paige Daigle were Chairman’s Guild recipients for their fine work in the Kinlin Grover Vacation Rentals division. The company’s top three teams were recognized in the in the next highest production category, Crown Club. Top teams included the Denise Dutson Team of the Mashpee office, the Kenny-Heisler Team of the North Falmouth office and the Bob Norton Realty Group of the Barnstable office. This category also included individual agents, Donna Gemborys of the Orleans office, Amy Harbeck of the Brewster office, Shane Masaschi of the Chatham office, Rick Shechtman of the Barnstable office and Ted Williams of the Osterville office. Beyond sales production awards, the company distributed an unprecedented number of nationally-recognized customer service awards to many of its sales associates. Additionally, 18 out of 22 Kinlin Grover offices were recognized with Diamond or Diamond Elite customer service awards, representing the largest number of offices to achieve this distinction. Additional recognitions included John Stringfellow of the Brewster office as Rookie of the Year and Ted Williams of the Osterville office for selling the highest priced property of the year, a $14.75 million gem in Chatham. Photo: From left to right: Mike Schlott, President, Kinlin Grover Real Estate; Sandra Tanco, Kinlin Grover’s top-producing sales agent in 2018; Doug Randall, CEO, Kinlin Grover Real Estate.